I was a skeptic. I admit it. As a long-time runner and believer in minimalism, adding an insole to my shoe seemed contradictory to my philosophy. 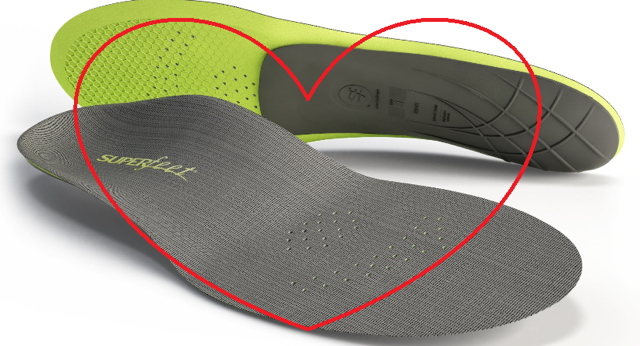 But the more I heard other Fleet Feet employees, as well as customers, rave about their experience with Superfeet insoles, I decided to at least look into the research behind them. After reading a few articles and watching some videos, the science behind Superfeet was convincing enough for me to give them a chance. So with reservation, I swallowed my pride and got myself a pair of Carbon Superfeet Insoles. In 2006, after multiple days of running inside on my hated treadmill due to rain, the skies finally cleared and I headed back out on the road. About halfway into my run, I jumped a puddle and felt something bad happen in what I thought was my groin. Really bad. To make a long story short, I tore my hamstring in an area so far up that massage wasn't an option. That injury sidelined me for a LONG time. Even walking was tough. In the 9 nine years since, I've been to every physical therapist, chiropractor, and doctor I could find and no one was able to alleviate the nagging pain that continued to occur from the injury. I developed sciatica from the scar tissue and not only was every run painful, but so was doing everything from sitting to standing to walking after my runs. I learned to live with the constant ache and kept running, but it definitely decreased the enjoyment factor. A lot. Back to my story... 4 days into my Superfeet experience, despite how annoying I found them, I stopped complaining. I even took them out and apologized to them. I told them I was sorry I doubted them and begged for their forgiveness. Why the dramatic change? Because on that fourth day, after my run, I all of a sudden realized that I didn't feel that all too familiar ache from my hamstring injury. And then I realized I hadn't felt it the previous 3 days either. I literally stopped and said out loud, "No way." But it was true. In the month that I've owned my now treasured Superfeet, I haven't felt my hamstring injury. Not once. Not while running, not after running. Nothing. Never in a million years did I expect the Superfeet to fix my hamstring - I thought they were for my feet! But I'm a believer and now join the ranks of the hoards of people who swear by them. Yes, I was wrong. So wrong. Give them a try... And be nice to them. Because they will be SO GOOD to you.